Middle East Distribution Transformer Market size was over USD 2.75 billion in 2015, and is anticipated to grow at 3.9% CAGR from 2016 to 2024. Growing demand for alternative energy and rising cost of generating electricity has led to transformation of conventional electric grid to smart grid. These products are a hub for collection and distribution of energy and a key component of successful transition to smart grid. There exists increased focus on renewable power sources such as solar and wind energy owing to limited availability of non-renewable sources. Integration of both renewable and non-renewable power source requires smart grid, which may drive Middle East distribution transformer market size over the next seven years. Need for skilled personnel for efficient operation of the equipment may hamper demand in the coming years. Inclusion of information technology in order to make these products suitable for the smart grid also needs IT professionals for manufacturing and testing as well as installation and maintenance. High distribution transformer market price trend may also pose a challenge to growth. The production cost is dependent on raw material prices, rated loss and features. Raw materials such as copper and steel are used in high amount, which increases the final product cost. Medium distribution transformer market was valued at over USD 1.2 billion in 2015 and is anticipated to witness the highest growth over the forecast timeline. This can be credited to swift implementation of these devices in the countryside or low-density populated areas to step down three-phase high voltage to low voltage for energy distribution. Rising copper prices is forecast to increase adoption owing to the use of less number of conductors in this product type. In addition, rising demand across plants and facilities with high power requirements such as data centers may also fuel product demand significantly. Small distribution transformer market size is anticipated to grow at 3.9% CAGR from 2016 to 2024. Rising implementation of these off-load tap changers equipped devices in indoor as well as outdoor applications may propel the industry demand. Furthermore, high cost-efficiency offered for low population density networks may further catalyze demand, over the forecast period. 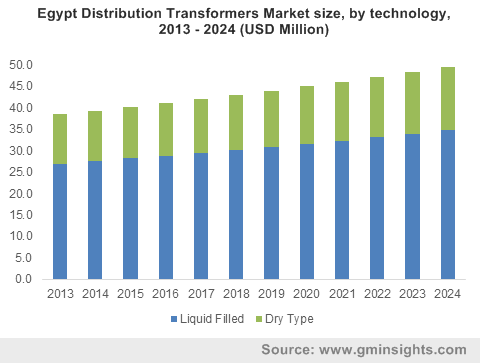 Liquid filled technology distribution transformer market share accounted for more than 75% of the regional revenue in 2015 and is anticipated to grow at 4.0% CAGR from 2016 to 2024. Growth in the segment can be attributed to numerous features offered such as highly cost efficiency and compact size. Dry type devices are preferred in applications where fire safety is of significant importance, for instance, mining sites, underground substations, marine, and other industrial applications. Noise generation is a prime problem faced in the environment surrounding the device. Several different techniques such as reduction of core flux density and using different core materials are expected to be used in order to address this problem. The industry may witness transformation from use of pure copper to copper-silver alloy in order to prevent from self-annealing. Saudi Arabia distribution transformer market size is set to exceed USD 1.5 billion by 2024 This may be attributed to rapid energy consumption across the commercial as well as residential sector. Regulatory initiatives such as establishment and development of nuclear power, integration of solar energy supplies, improved efficiency and reliability of electricity transmission and distribution are expected to be the key drivers for investments in the region’s electricity infrastructure. UAE contributed more than 8% to the Middle East distribution transformer market share in 2015. Increasing adoption across centralized chilling or generating plants, large footprint warehouses and high-rise buildings is estimated to offer avenues for growth. Several benefits offered including long feeder lines, reduced cable size and length, and increased usable footage area may also catapult growth significantly over the coming years. Key industry players contributing to Middle East distribution transformers market share include Abaft, ABB Group, Alfanar Electrical Systems, General Electric, Bawan, and Intact. Other prominent industry participants include Matelec, SGB-SMIT, Siemens, Tesar, etc. Middle East power sector demand will witness high growth owing to rapidly increasing population and urbanization, leading to development of smart cities. Further, key power sector players such as Siemens and GE have cemented their regional footprint by diversification or mergers & acquisitions. For instance, acquisition of Alstom by GE brought together two key players to create GE’s power service business offering total plant asset and lifecycle solutions that can support equipment. Raw materials used in manufacturing include bushing (a type of plain bearing), copper, CRGO steel, insulators, steel and transformer oil. Vendors provide a wide range of custom specific materials to the manufacturers. In order to provide high quality products, suppliers focus on utilizing sophisticated fabricating technology. Further, vendors also focus on providing raw materials that are tested on several parameters in order to deliver high quality products to the manufacturer, and the key focus is on features such as durability, easy and hassle-free fitting, corrosion resistance, and efficient functioning. The industry is characterized by medium degree of backward integration with in-house raw material manufacturing in order to meet quality standards and demand fluctuations. These devices are normally positioned at a service drop, where wires run from a utility pole or underground power lines to customers’ premises. These are usually installed for the facilities power supply outside the settlements such as farmyards, isolated houses as well as pumping stations.